David Weekley, after being let go from his previous job, was inspired to step out on his own and at just 23 years old founded his own company, David Weekley Homes. What started out as a Houston business venture has since become a multi-regional powerhouse. In 2013 David Weekley Homes was named National Builder of the Year by Professional Builder Magazine for its second time, making the company one of the only two builders to ever receive this distinction. In addition to being a successful businessman, Weekley is also an accomplished Eagle Scout, devout Christian, family man, and generous philanthropist, donating his time to both domestic affairs and international. Weekley’s work also garnered him a Best in American Living Hall of Fame berth in 2014. 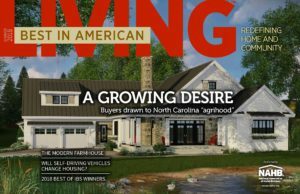 Showcase your winning production homes when you enter this year’s Best in American Living Awards.